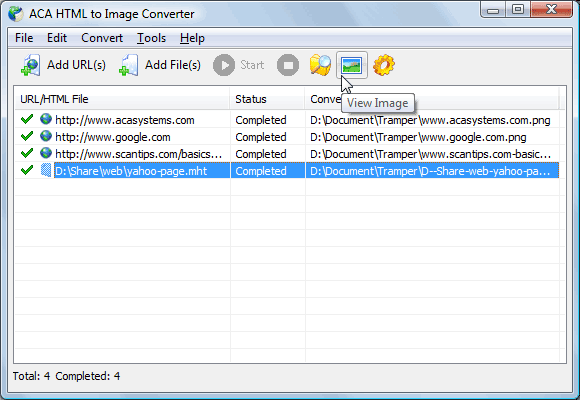 You are here: ACASystems » ACA HTML to Image Converter » FAQ » How to convert MHT file to image? How to convert MHT file to image? MHT (MIME Encapsulation of Aggregate HTML Documents, MHTML) is a web page archive format used to bind resources which are typically represented by external links (such as images, Flash animations, Java applets, audio files) together with HTML code into a single file. 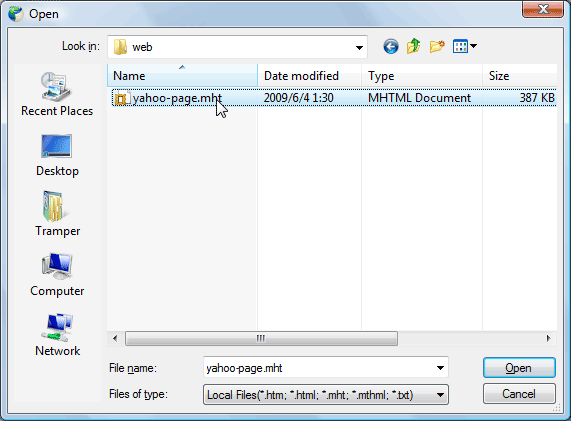 This format is sometimes referred to as MHT, after the suffix .mht given to such files by default when created by Microsoft Word, Internet Explorer or Opera. Sometimes, we want to convert MHT file to image for archiving, publishing, printing or sharing to a friend, in this tutorial we will see how we can convert MHT format to image format using ACA HTML to Image Converter. ACA HTML to Image Converter allows you convert web page, HTM, MHT and TXT file to image or thumbnail of a specified size in batch, saves the long web page as JPG, GIF, PNG, BMP, TIFF, WMF and EMF image by one click, even if it scrolls off-screen. This sample shows how to convert MHT file from local computer and save as a PNG image. 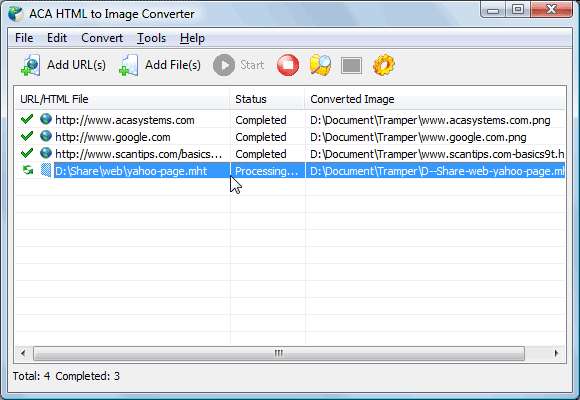 Launch ACA HTML to Image Converter. If you didn't install it on your computer, please download ACA HTML to Convertre and then install it. Select .MHT file(s) in the Open dialog, and then click the OK button. For example: d:\share\web\yahoo-page.mht. If the task is completed, you can select the task item, and then click "View Image" button to open the image in your default image viewer. Note: The default image format is set to PNG format (the best web image format). If you want to save MHT file to other image format (JPEG/BMP/GIF/TIFF/BMP/EMF/WMF), just simply click menu Tools -> Options -> Image to change the image format. Wikipedia: MHTML - short for MIME HTML, is a web page archive format. Tutorial: How to convert HTML to picture. 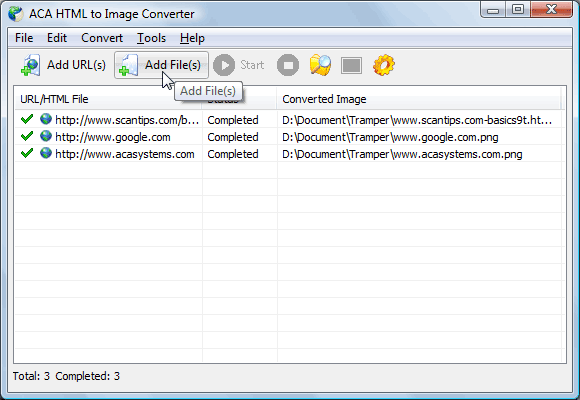 Online Help: Image Options - ACA HTML to Image Converter supports for BMP, JPG, GIF, PNG, TIF, WMF and EMF formats. You can adjust the image format, size in Image Option dialog.